Multidisciplinary Research – A Challenge and An Opportunity? Today I will facilitate a research round table at Webster University Geneva. Over the past couple of years a team of researchers has been developing coming from different fields (management, economics, sociology, psychology, etc.) and disciplines (HRM, marketing, accounting, finance, etc.). Bringing together such a diverse group is a challenge. However, with the continued call for science to engage in research and theory building at the intersection of disciplines and fields this challenge becomes an interesting opportunity (albeit still challenging). Zahra and Newey provide an interesting perspective on the impact of multidisciplinary research (see picture). 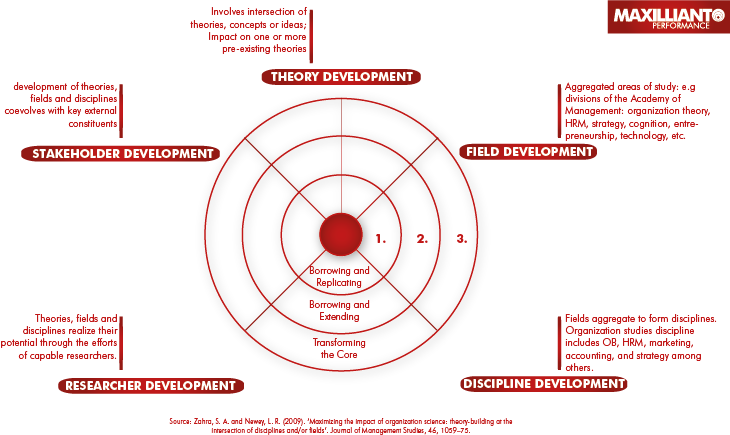 Stakeholder Development (Development of theories, fields and disciplines coevolves with key external constituents). Mode 3: Transforming the Core (using intersection as a new domain to develop new theory – example: social entrepreneurship = Corporate social responsibility + entrepreneurship). What are your experiences with multidisciplinary research?